It’s always nice to get some praise for a job well done, and even better when they put that in writing. 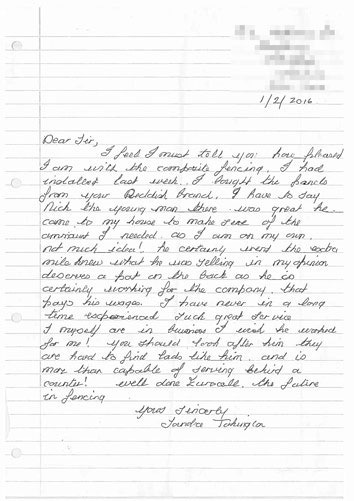 So we were delighted to receive a really fantastic letter recently from Sandra Torkington from Stockport, who some choice words to say about our new Composite Fencing, and Nick from the Reddish branch, who was on hand to assist and advise. 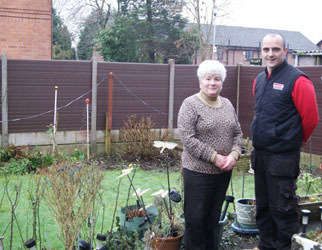 In respect of the fencing she says “How pleased” she is with it, and that “it’s the future of fencing”. Praise indeed, yet nothing to that for Nick who: “Went the extra mile”, and “deserves a pat on the back”. And, overall, Sandra hadn’t “In a long time experienced such great service”. And, finally, if it’s not too immodest: “Well done Eurocell”! Well: thank you Sandra – it was our pleasure. I feel I must tell you how pleased I am with the composite fencing I had installed last week. I bought the panels from your Reddish branch. I have to say Nick, the young man there was great. He came to my house to make sure of the amount I need as I am on my own – Not much idea! He certainly went the extra mile and knew what he was selling . In my opinion he deserves a pat on the back as he is certainly working for the company that pays his wages. I have never in a long time experienced such great service. I myself are in business and I wish he worked for me! You should look after him- they are hard to find, lads like him and is more than capable of serving behind a counter! Well done Eurocell – the future in fencing! To see the difference that could be made to your garden have a look at our Composite Fencing pages here.